North American elk, or wapiti, are among the most majestic animals on the continent. Second largest of the deer family, exceeded only by the moose, elk once ranged over all of Canada, the United States (except for Florida) and northern Mexico. 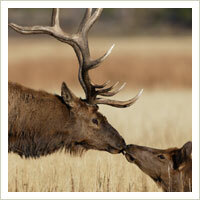 Elk and man have interacted since the earliest human habitation of the continent. Elk bone and antler have been found in some of the oldest human inhabited sites in North America, and accounts of the early European explorers mention the strong impression these proud animals made on them. The ranching of elk in North America goes back to at least the mid-nineteenth century, following a tradition of ranching of native species that extends back to the beginnings of agriculture. There are an estimated 70,000 farmed elk in North America, descended from generations of domesticated stock. Today, the capture of elk from the wild is illegal, and no reputable elk rancher will have any part of such activities.